Whim Things 1 Year Anniversary! This past June 2nd marked the 1 year anniversary of Whim Things, the embellished statement hats company I co-own and operate with Jen Lee. We can't believe that we've already marked off a year being in business and are so humbled and appreciative of all of the support from loved ones and our customers. Early May of last year, I had wanted to make a present for my mom; I saw these cute embellished sun hats with sayings on them but they were upwards of $500. I was thinking, 'I love you mom, but I can't afford to get this $500 hat for you', so I purchased a sun hat and black rick rack trim and created a hat for her. I used the rick rack trim to write out 'Smile! ', although the script wasn't the best, she really loved it and I thought this would be a great idea for my girlfriends and I to wear during our weekend getaway in Palm Springs. So I reached out to my girlfriends to see if they would want a personalized hat (Jen being one of the girlfriends), and later got together with Jen after buying hats and sequin trim, and she hand wrote each hat saying and we affixed the sequin trim to the hats. We all wore our hats during a pool party and after posting an image of us in our hats, we got an overwhelmingly positive response to the hat designs, and people were inquiring where they could purchase them. I approached Jen with the prospect of possibly creating a business where we could customize sun hats, so while enjoying a Cajun crawfish dinner, we decided that we would go ahead and move forward with creating Whim Things. We started selling on instagram, then transitioned to an online storefront interface. We have gotten to do a wide range of hats from vacation sayings to bridal and bachelorette related hats. We've also explored selling other customized items such as zip pouch bags, wool fedora hats and berets; as well as accessories like choker necklaces and headbands. Our bread and butter has always been our personalized hats and we create each one by hand! To celebrate our 1 Year Anniversary, we have teamed up with zeroUV to host a summer party! To attend or for more event details, visit our eventbrite page here. The first 100 early bird RSVPs will receive a custom handwritten tote bag with their IG handle or name, a free pair of zeroUV eyewear and summer goodies. We are also excited to have so many great sponsors on board which you can read more about and discover below. This inspirational eyewear company was founded in 2001 by eyewear enthusiasts and has become a prodigiously curated eyewear boutique for the fashion savvy individual. zeroUV not only offers the latest in sunglass and glass styles, but also sets the trends in the industry. Working with members in the fashion and media industry has allowed them to stay at the forefront of the eyewear market and also provide a great shopping experience whether online or in their showroom space. Based out of Huntington Beach, CA, we are excited to be partnering up with zeroUV and their space to host our 1 Year Anniversary Party! Jen and I combined, most likely have hundreds of pairs of zeroUV sunnies, so it's safe to say we are fans of the brand. I've gotten the pleasure of getting to play around with the Fresh Prints photobooth on numerous occasions, I love how easy it is to use - guests receive fun prints and digital copies which can be sent to their email or phone. We're beyond thrilled that Fresh Prints will have their photobooth at the party for our guests to capture the moment. Snap pics wearing wacky and bold zerouv sunglasses or with props! This is a great souvenir to take home from the event. With humble grassroots beginnings, Sleekhair has grown into an internationally recognized online retailer providing over 30,000 cosmetics, hair and skincare products for all beauty needs and desires. I remember when I first visited their HQ in 2014 and got to meet the Sleekhair team, kicking off our collaborative journey together. Since then, I've taken part in product reviews and features, wardrobe styled a sleektv trends video, co-hosted beauty/fashion charitable shopping events, been apart of their beauty panel during Stylecon and actually launched Whim Things at their HQ during a summer event last year. Jen and I are very thankful and appreciative for Sleekhair COO Joan and the amazing team for always including us in opportunities. Sleekhair will be at our party with a pop up shop, as well as beauty bars! The go-to spot to make all your candy and sweet treat dreams come true, B.Candy has it's first location in Corona Del Mar and a recently opened location at Pacific City in Huntington Beach. This place is an absolute delight for your senses, it's the modern Willy Wonka Chocolate Factory for all things candy, sweet, cookies, cupcakes ice cream and more! I had the pleasure of getting to co-host an event with Emily Loftiss at B.Candy's CDM location and it will be a blast for our guests to experience B.Candy with a candy bar and cupcake and sugar cookie treats. Wife and Husband Duo Haley & Eric blend their love for their home state and feelings of adventure with hand-poured, non-toxic soy candles named after California cities. I first discovered NESW WAX CO through my fiance who actually works with Eric the co-founder. Scott would gift me candles, and then we’d start attending their pop up shops and I would stock up on 3-6 candles at a time because they just smell so good and I like the sense of California wanderlust with each candle. Candles are packaged in a mason jar and complete with a sticker of the California city and coordinates. Some of my favorites include Palm Springs, San Diego and Huntington Beach. This online boutique just launched last year and has been making waves with their on trend clothing and accessory pieces. Jen and I have both gotten to work with Haute Shop Co through our personal blogs and can't wait to share some boutique goodies with our party guests. Jen and I are major fans of the swimwear brands Becca Swim + Isabella Rose. BECCA is designed by Rebecca Virtue in Orange County, CA, combining fit and function for the female form with exclusive fabrics and prints to bring you a modern and stylish swimwear line. Isabella Rose marries contemporary style with feminine elements; lots of floral, crochet, mesh and lace trims. This is definitely mine and Jen's go-to swimwear line when wanting to style a festival inspired outfit that involves bikinis or one-piece suits. We have done a couple giveaways with both swimwear brands and are excited to have BECCA and Isabella Rose as sponsors for raffles prizes! Have you ever spent so much time racking your brain around a gift to get someone, and you end up getting a gift card for them? Well Thoughtfullly has taken the frustration out of finding the perfect gift with their specially curated gift boxes. 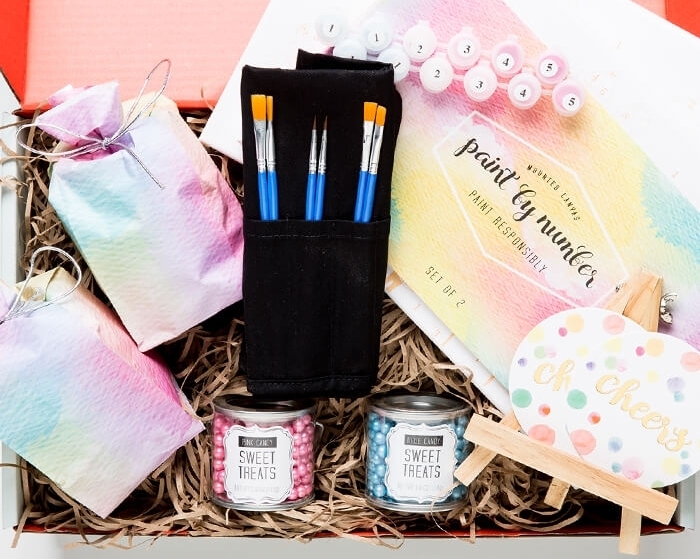 Each themed box has a narrative through novelty and gift items. Get boxes geared for all types of people and personalities. This budding teen photographer has already jumped right into the industry by photographing various Sleekhair events as well as getting to snap well known beauty blogger/vlogger Roxy Limon. She is following in the footsteps of her mom Ivy of Ivy Love Shop with her creative and entrepreneurialspirit and we are delighted to have Idalys photograph the event and to share her photos with you! Photos via each brand's respective website or social media platforms.